Various depictions of nature is an ongoing focus in my work. My current paintings and installations speak to a warming planet, invasive plant and animal species, rising tides, and their effect on and transformation of our landscape and natural resources. 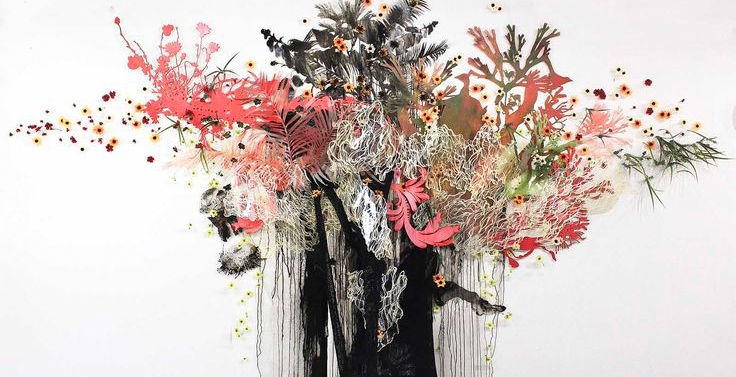 To reflect this concept visually, the artworks’ subjects and surfaces are layered, and sometimes the surfaces are split apart with laser-cut forms that mimic tree branches, coral, and flora. This creates a physicality and metaphorical sound like the poetic violence of a glacier calving. As we become ever more aware of the precarious nature of our habitat, this work speaks to the vulnerability of the earth that we still so easily take for granted. I also make paintings of various sizes on traditional wood surfaces, both rectangular and oval.